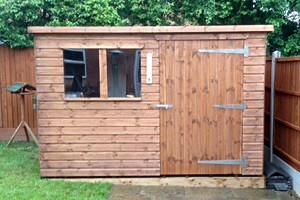 At Sunningdale Timber, we design and build bespoke sheds and wooden structures for your home in Leicester. From garden storage to pet kennels and children’s playhouses, our expert team will work with you to create a structure that meets your requirements perfectly. We take great pride in the speed and efficiency of our service. We aim to design, build and deliver your made-to-measure structures, to your home in Leicester or the surrounding areas, within 3 to 7 working days where possible. All of our sheds are made from the highest quality T-Grove/Shiplack and boarding, which leaves us confident that you will be thrilled with the final result. 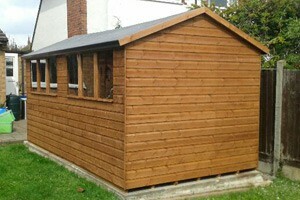 The sheds and wooden structures that we design and build are suitable for all sizes and shapes of gardens. As our products are made-to-measure we can help you to create a feature that fits your garden in a practical manner. So whether you are working with limited space or just want a highly bespoke design feature, our team are ready to help. To give you an idea of the types of shed and custom wooden structures that we can create, you can browse through our images - but don’t forget, we can tailor any order to meet your budget, size and specifications. At Sunningdale Timber, we are always happy to discuss your needs and work with you to achieve an outstanding product. Our expert team are able to build and install any wooden structure to suit your exact specifications and taste. 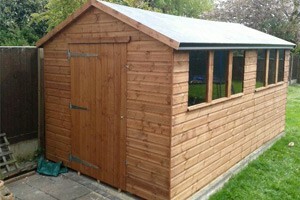 All of our sheds are built by hand and are made from high quality materials. We even offer a free local delivery service within the Leicester and Leicestershire area, and installation can also be arranged by our own highly trained fitters at a convenient time to suit you. For a free no-obligation quotation or for further help and advice about our services, please call us today on 0116 2312876, where we will be happy to help you further. All of our products are made from high quality materials. All our products are made to order and delivered within 3 to 7 working days where possible. We also offer a "made to measure" service, meaning we can build to your exact requirements and tastes. Framing Ex 50 x 50 Red Wood. Cladding T/G or S/H 12mm finished size. Flooring 12mm T/G, 50x50 bearer, 300mm centres. Door Frame 100 x 50mm. Doors & Fittings 100 x 50 bearers. 12mm cladding T/G. 3x hinges 18". 1 x 6" pad bolt. Windows Size 24" x 20" approx. Multi-flex panel's. Felt Heavy duty chester green mineral felt. Delivery 3 to 7 working days where possible. Free delivery within the Leicester area, and installation can be arrange by our own highly trained fitter. We can also arrange for your base to be fitted. Get in touch.